I have forgotten the last day I spent without writing anything, I carry a notebook in my manbag, I have a notepad installed on every mobile device I own, at work I carry notepads that get consumed faster when writing notes than on actual work related purposes, and even when I’m ill, or depressed, I’ll excise my frustration through words, or simply force myself to put pen to paper, hand to keyboard, black to white in some form so that I can say “today I created something”. It works for me, I’ve looked back over some of my old work and, while I appreciate a lot of the ideas behind some of my old pieces – even on GeekOut – I still mark several differences in my writing style since I began. Even now I’m writing this at… let’s see, 00:51, ten-to-one in the morning, having woken up at an obscene hour to start the day, desperately constructing a quiz for tomorrow’s (today’s) GeekOut Shrewsbury Meet, printing the bomb defusal manual for Keep Talking And Nobody Explodes, and getting the daily duties done like eating a real meal and not just coffee and another cookie. I do it because it makes me productive. It forces me to strive, and to accomplish, to complete projects that I set out to achieve, like the books I’m working on, the company I’m trying to set up, something more than watching all of Deep Space 9 so that I can draw judgemental comparisons to Babylon 5. And dammit I have kept to my schedule of work, producing regular content for GeekOut, beavering away at side-projects, and getting things done. I wrote the comment above, and deleted it, in that dramatic “hold down the backspace button even though you don’t have to” fashion. Why would I encourage someone wanting to enjoy an old hobby to dive so fanatically into it in the way I have? If they had the mad devotion to writing I have then surely they wouldn’t need the advice, and if they take that advice they’ll soon lose interest in writing. I don’t draw for example. I can draw, and I’ve no doubt I could get good at it if I devoted myself to the task, but why would I do that when a quiet doodle every now and again helps me relax after a month of hard written work? I enjoy it enough, and tend to destroy my sketches once they’re done to my satisfaction, but I take no pride in the work or set much store by the end product. It is fun. Ultimately, if you enjoy something enough that you are willing to exhaust yourself to do it, then you are going to get good. That goes for writing, drawing, programming, the physical activities, or even public speaking. Bur don’t motivate yourself out of a good thing. Keep your hobbies as just that, and only let your passions consume you. … Yeah, that’s what I should have wrote at the time! 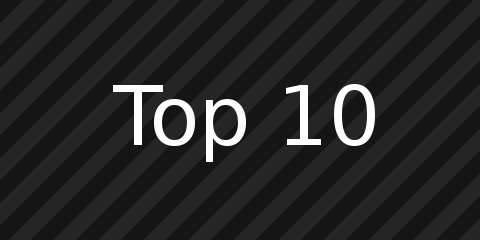 It’s been a while since we last spoke about our highly ambitious eBook, capturing our Top 10’s in a format which is both similar to a digest, but yet comprehensive enough for anyone who hasn’t had the experience of our Top 10’s before. Naturally, we’ve been thinking long and hard about it, but there’s a lot of time and planning involved with a project like this. So, if you’ve ever been faced with making an eBook before yourself, let’s look at what we’ve been doing behind the scenes in order to get on with it! As an avid reader, some of my favourite stories involve underdogs; someone we want to root for, because we feel for their plight. We don’t necessarily want them to become a hero, but if they do then we want them to be the best hero they can be. We don’t want them to immediately win – And no hero, no matter how great, should immediately win unless it’s a parody. Following on from Creating The Monster from a few weeks back, this is how you can have the Hero Fight The Monster. My friend Nathan has been turning his hand to writing of late, because he has an idea and he’s damn well going to run with it. Now, he’s the first person to tell you that he’s not a great writer, and very sensibly and admirably turned to myself and Kim from Later Levels for advice on writing form, but after years of gaming with Nathan I can say that he has an excellent grasp of character and motivation, the impact of a character on narrative, the impact of a character’s history on their decisions, and he also has a perverse sense of humour. Enter the character of Tom Permahorn, typically “Nathan” in that the character has an odd brutish nobility, a family tie to a clan of orcs (he really likes his orcs) and a uniqueness that sets him apart from your typical sword-and-sorcery brute. Despite the wall of text unfettered with paragraphs, the faltering pace, and some difficulty surpassing the grammar and choice of words, it took very little effort for me to see the bones of something of great quality. Nathan sent me the first few thousand words of The Misadventures of Thomas Permahorn, a fantasy farce with the eponymous Permahorn as the questionable protagonist. So far Marvel’s roster of villains has been good enough. Outstanding examples are few, but they rarely detract from the quality of the film and have never been so bland, poorly motivated, and misinterpreted as to match up to Jesse Eisenburg’s portrayal of Lex Luthor! * Most appear for a single film, and are gone for good by the end because most of the heroes in the cinematic universe aren’t so foolish as to keep their rogue’s gallery imprisoned, they just go for full blown obliteration.